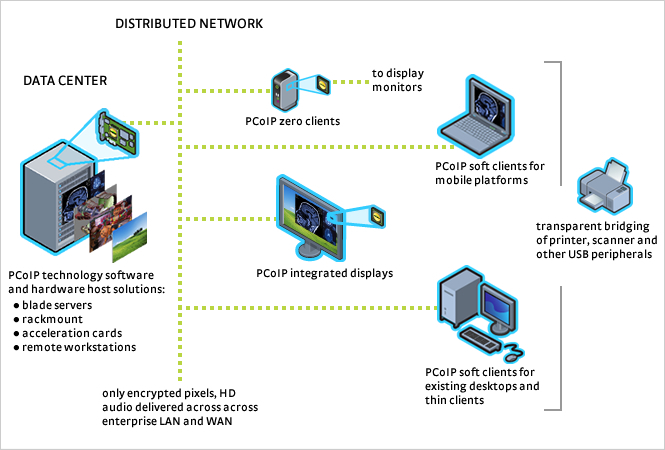 PCoIP technology is the result of a breakthrough in display compression for connecting desktops over existing, standard IP networks. PCoIP technology allows all enterprise desktops, from task workers to power users, to be centrally located and managed in the data center, while providing the remote user with an exceptional user experience. The PCoIP protocol compresses, encrypts and encodes the entire computing experience at the data center and transmits it ‘pixels only’ across any standard IP network to stateless PCoIP zero clients. Your data never leaves the data center. The PCoIP protocol is implemented in silicon for hardware accelerated performance, and in software in VMware View. It supports high resolution, full frame rate 3D graphics and HD media, multiple large displays, full USB peripheral connectivity, and high definition audio, all connected over the corporate LAN or WAN. In a regular PC, the applications, OS and graphics drivers are tightly coupled to the display and optimized for performance. With client rendering these components are separated by a network. To render an image, each command from the host and response from the client has to travel across thenetwork which degrades application performance as it waits for the rendering to complete. Host renderingpreserves the PC environment, so that applications perform as they should. Once the image is rendered on the host, the PCoIP protocol broadcasts just the encrypted pixels (not the data) across the network to the client which makes it possible to have stateless, decode-only client devices we call them true zero clients with all the benefits they bring such as low maintenance, increased security, and cost savings. Because the client doesn’t know anything about the application (it just has to decode the pixels to display the image) there are no application dependencies or incompatibilities between the host and the client and future applications will simply work which increases the client’s lifescycle. Host rendering also improves latency insensitivity. With the PCoIP protocol, the one-way delivery of just pixels to the zero client provides complete independence from network latency and bandwidth limitations and enables a rich user experience even on high latency wide area networks. Because not all image elements on a PC display are of the same type, it makes no sense to use the same codec for everything that would use excessive network bandwidth. Instead, the PCoIP protocol continuously analyzes and decomposes image elements graphics, text, icons, photographs, video, etc and compresses them with the right codec for each and every pixel. Intelligent image decomposition and optimized image encoding using multiple codecs enables efficient transmission and decoding, and saves your bandwidth. And, PCoIP codecs build every pixel to a lossless state once they stop changing, to ensure a pixel-perfect image regardless of network limitations. Image quality settings of the PCoIP protocol can be easily configured to manage bandwidth use and PCoIP adaptive encoders automatically adjust image quality on congested networks within the limits you set then resume maximum image quality when the network is no longer congested. Because PCoIP protocol doesn’t transfer data files, just the pixels themselves, it makes sense to use a real-time protocol to ensure a responsive, interactive remote user experience. For that reason the PCoIP technology uses UDP, the same protocol as Voice over IP and IPTV, to reduce bandwidth requirements and deliver the best interactive user experience for the network bandwidth that’s available.